Journal Reference: Tang Q, S Xie, Y Zhang, T Phillips, J Santanello, D Cook, L Riihimaki, and K Gaustad. 2018. "Heterogeneity in Warm-Season Land-Atmosphere Coupling Over the U.S. Southern Great Plains." Journal of Geophysical Research: Atmospheres, 123(15), 10.1029/2018JD028463. Mean warm-season (May–August) geographic patterns of years 2004–2011 for (top left) soil moisture (SM) and (top right) leaf area index (LAI). Site locations are marked by circles. 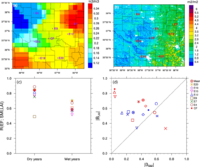 (Bottom left) A 16-day averaging multiple correlation coefficient R(EF; SMI, LAI) as a function of dry (2006 and 2011) and wet (2007 and 2008) years at different locations. (Bottom right) Scatterplots of absolute values of standardized regression coefficients BLAI versus BSMI for dry (red) and wet (blue) years. EF = evaporative fraction. Land-atmosphere (LA) coupling has been identified to play an important role in climate through its impacts on the energy and water cycles in the Earth system. The driving mechanisms of how the land states (e.g., soil wetness and vegetation) impact the surface turbulent fluxes are not well understood. 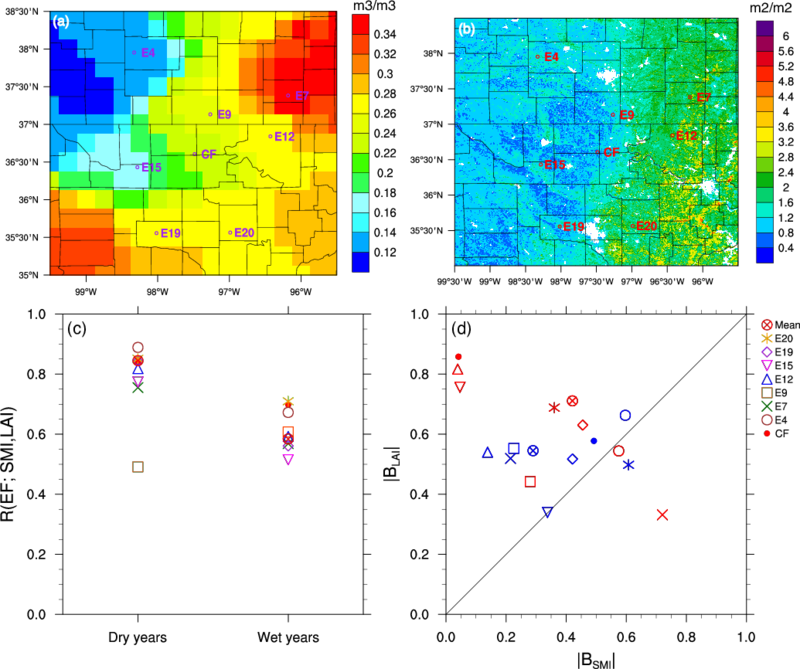 The United States Southern Great Plains (SGP) is identified as one of the coupling “hot spots” by modeling studies. Recent observational studies quantify a wide range (weak to strong) of coupling strength depending on impacting factors (soil moisture or vegetation) considered in the analysis. With the long-term, multiple-station, collocated Atmospheric Radiation Measurement (ARM) facility measurements and Moderate Resolution Imaging Spectroradiometer satellite remote-sensing data, our present study establishes a new LA coupling metric to provide more robust, comprehensive, observation-based warm-season (May–August) estimates of the terrestrial segment LA coupling strength at the SGP domain (see figure). This study reveals great heterogeneity in warm-season LA coupling at the SGP. Such large spatial variability over a relatively small area (mesoscale) has not been illustrated with observational data before, and hence has important implications for both climate modeling and observations on, for example, the importance of capturing the sub-grid-scale variance with model parameterizations and a dense observational network. We examine the LA coupling strength at seven additional locations with the same surface type (i.e., pasture/grassland) as the ARM SGP Central Facility (CF). To simultaneously consider multiple factors and consistently quantify their relative contributions, we apply a multiple linear regression method to correlate the surface evaporative fraction (EF) with near-surface soil moisture (SM) and leaf area index (LAI). The observations show moderate to weak terrestrial segment LA coupling with large heterogeneity across the ARM SGP domain in the warm season. Large spatial variabilities in the contributions from SM and LAI to the EF changes are also found. The coupling heterogeneities appear to be associated with differences in land use, anthropogenic activities, rooting depth, and soil type at different stations. Therefore, the complex LA interactions at the SGP cannot be well represented by those exhibited from data collected at the CF/E13 based on the metrics applied here. Overall, the LAI exerts more influence on the EF than does the SM due to its overwhelming impacts on the latent heat flux. This study complements previous studies based on measurements only from the CF and has important implications for modeling LA coupling in weather and climate models. The multiple linear regression provides a more comprehensive measure of the integrated impacts on LA coupling from several different factors and can be readily extended to other measurement locations and model simulations to include the atmosphere and planetary boundary layer feedback, entrainment, ambient temperature and humidity, and clouds and precipitation, and their relationship with the land surface (SM-EF-LAI) variables of interest.